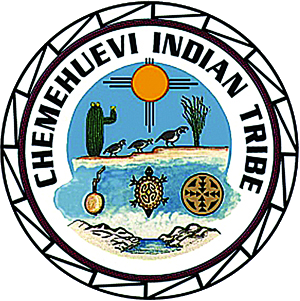 The Chemehuevi Reservation is located on the shores of Lake Havasu, in southeastern California on the Arizona border; 25 miles of the reservation boundary run along the shores of the lake, and 27 acres are located on prime lakefront property. The Chemehuevi Reservation was established by an Executive Order in 1970. The Chemehuevi people are considered to be the most southern group of the Southern Paiute Indians, who are linguistically related to the greater Uto-Aztecan language family which includes languages spoken by peoples from the Great Basin south into central Mexico. For subsistence, the Chemehuevis traditionally gathered seeds and, after the coming of the Spanish, planted wheat along the Colorado River. The reservation is governed by a nine-member elected tribal council, with a constitution and bylaws drawn up under the Indian Reorganization Ace of 1934. The council includes a chairperson, a vice-chairperson, and a secretary-treasurer. Tribal officers serve for three-year terms. In addition, various standing committees such as the resource development committee, the administration committee, and the human resource committee, report to the tribal council.